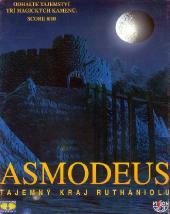 Asmodeus: The Mysterious Region Ruthaniolu is a game combining elements of classical action RPG and adventure game. The player controls one character named Mot in perspective from their own eyes, which must for her master to get the 3 magic stones, so that he could summon the ancient demon Asmodea-Eterony. It's a quite important game in CD version as it's a complete Czech dubbing, nice music and a few animated scenes. The game system is similar to the classic dungeon fighting action rpgs.